This afternoon my beautiful German 1930’s railway clock has been returned to me, with new glass and an overhauled mechanism. I bought it somewhere in the suburbs of Adelaide, Australia with Helen Carter, we were supposed to be traveling to Uluru, but the car had broken down and we were browsing whilst waiting for repairs. Today, when we hung the clock by the door in the lounge it wouldn’t run, so we moved it to the wall by the window and it is now ticking contentedly, filling the room with a warm and familiar beat. We all work more contentedly when we find our place, I have certainly been feeling that way of late. 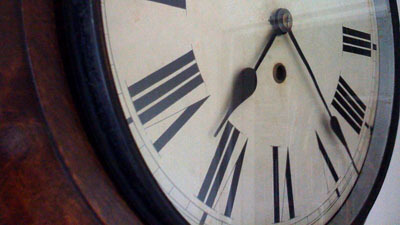 This entry was posted in Documentary and tagged clock, contentment, time. Bookmark the permalink.